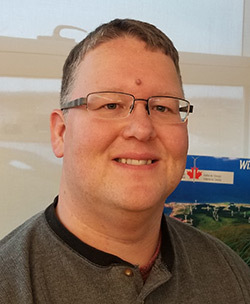 Robbie Sanderson, a native of P.E.I., joined the Wind Energy Institute of Canada (WEICan) in December of 2017. Robbie is involved in overseeing data collection at the Institute with a focus on facilitating research collaborations. Robbie completed a B.Sc. (Physics) at the University of Prince Edward Island before moving on to M.Sc. and Phd. degrees in Physics at Dalhousie University in Halifax, Nova Scotia. Previously, he worked as a research associate and lab manager under the supervision of Prof. Jeff Dahn at Dalhousie University. During this time his primary area of focus was research into energy storage materials, with a focus on Li-ion batteries and Pt based fuel cell catalysts. This work has led to over 40 publications. Robbie has recently transitioned to wind energy research, but he sees it as an important step to meeting the ever expanding demand for renewable power.